[in red]: Public School held in Oswego Grange Hall prior to 1893 - when that school was erected on highway - replaced later by brick building - Principal - Mr. H.T. Evans; Teachers - Mary Bickner & [in pencil]: Miss Wetherell. 14. Edna K. Bickner, 528 2nd St., Oswego, Oregon. 1892 - 3; Grange hall school. Description Mounted on cardboard; stain on upper left corner; pinhole; scanned as B & W. Same as 370b & c. Accompanying sheet of paper: "Hard Back Pictures, for the dedication of Library. 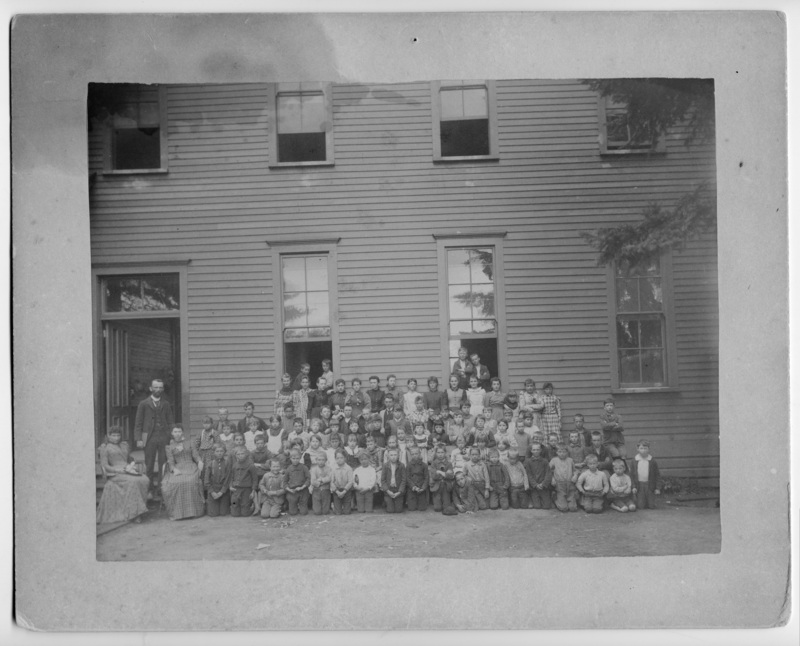 Grange Hall School about 1892 or 3, gift of Ava Bickner Crowe. Teachers: Prof. H.T.Evans, Miss H.M. Wetherell, Miss Mary Bickner. 1st row: Phil Pollard, Ed Pollard, __, George Fortner, Emil Dhooghe, __, Harry Webb, Chas. bickner, __ Spawn, Dora Foote (? ), Herbert Dyer, Chas. Johnson, __, Raymond Lee, Emil Spawn, Arthur Rhome, __, John Fox, Ed Blanchard (?). 2nd row: Amos Uhler, Arthur Ball, Frances Nida, Ethel Hallinan, Norma Morrine, Gladys Tufts, May Blanchard, Lena Van Duyse (? ), Louise Kramer, Anna Blanken, __, Polly Kramer, __, __, __, Dan Monroe, Leslie Manning. 3rd row: Lillian Bickner, Ella Ball, Pearl Nida, Pearl Haines, Ernest Smith, Rose Gans, Ella Bulock, Florence Barnett, __ Jones (girl? ), Minnie Nida, Maggie Monroe, Katie Monroe, Maggie Hallinan, Hannah Wells, Winnie Smith, __, Frank Spawn, Sam Brown. 4th row: __ Spawn (? ), __, Manley Manning, Willie Webb, Lester Walling, John Bickner, Otto Larson, Guylem Jones, Lena Blanken, __, May Morland, Agnes O'Brien, Annie Wells, Mattie Fox. Back row: Anneta Pauling, Lucia Bethke, Lillian Gans, Ada Foote, __, Blanche Dyer, Annie Larson, Agnes Nelson, Beatrice Morrin, Grace Edwards, Willie Jones, Elsie Walling, Frances Walling, May Marles, Constnace [sic][Constance?] Smith. In the windows: ___, ___, Charles Walling, Richard Ball. Transcription [in red]: Public School held in Oswego Grange Hall prior to 1893 - when that school was erected on highway - replaced later by brick building - Principal - Mr. H.T. Evans; Teachers - Mary Bickner & [in pencil]: Miss Wetherell. 14. Edna K. Bickner, 528 2nd St., Oswego, Oregon. 1892 - 3; Grange hall school.